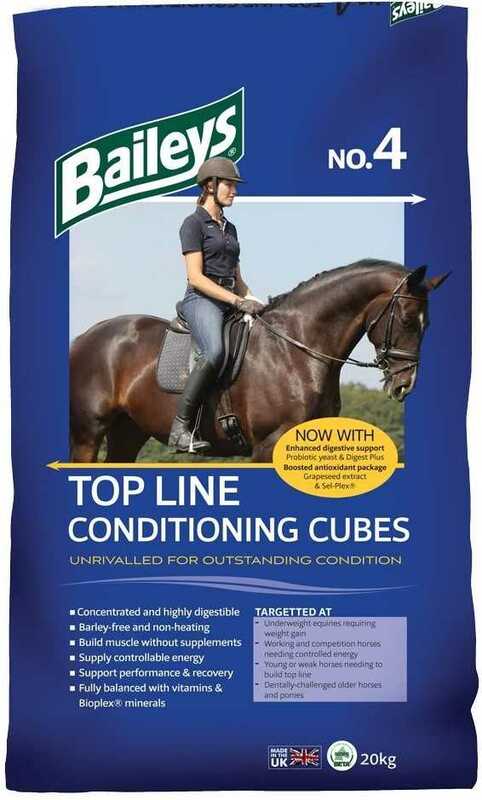 With a superior vitamin and mineral profile, including chelated (Bioplex®) minerals, Top Line Conditioning Cubes are incredibly versatile and can be fed to all types of horses and ponies at rest, in work or competing up to the highest levels. Indeed they are now well established as a favourite amongst competition riders who appreciate the excellent muscle tone and improved stamina they promote. The new formula now also includes a boosted natural antioxidant package, containing grapeseed extract, vitamin C and E and Sel-Plex® organic selenium, to support the immune system, which is particularly beneficial to underweight horses who may be generally run-down. In addition, the new formula includes probiotic yeast and Digest Plus prebiotic to promote digestive efficiency, which is advantageous to horses that might be travelling and competing frequently and require additional digestive support. Equally, their digestibility also makes them an excellent choice for the older equine, especially those with poor dentition since they can be easily softened with warm water or soaked beet pulp. Micronised Wheat, Nutritionally Improved Straw, Wheatfeed, Distillers’ Grains, Micronised Soya Beans, Molasses, Soya Oil, Calcium Carbonate, Vitamins and Minerals, Calcined Magnesite, Sodium Chloride, ScFOS (Digest Plus prebiotic), Grape Pip Solubles.